I was brought onto this residential project near St Helena by Santa Rosa interior design and retail studio Ireko. The client was remodeling the home, and wanted to add a large, baroque mural over the huge stone fireplace that dominates one wall of the great room. This mural is, in essence, a family portrait, incorporating personal details unique to each family member. An important part of the design process was integrating these elements into a cohesive image. 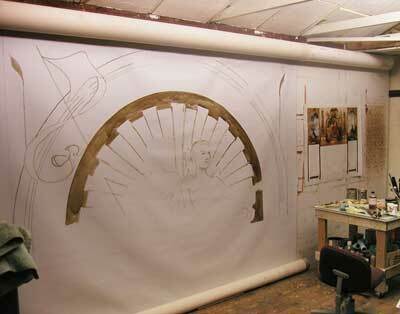 What you see below is a completed, 1'' - 1' scale maquette, measuring 10 ½” x 25”, showing how the full-scale finished mural (10 ½' x 25') will look. 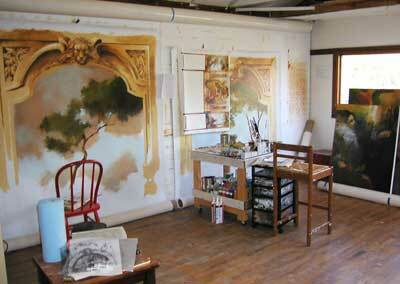 This large canvas has been sealed, primed and sized for painting of the central image. 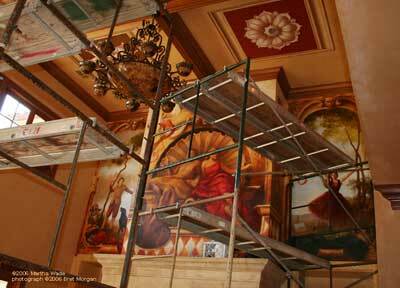 The mural was divided into several sections which, once completed, were seamed together during installation. Here, I have begun the drafting process. You can see the maquette to the right of the image, placed for visual reference. A progress shot showing the two side panels. Photographic updates of each section were sent to the client throughout the process. 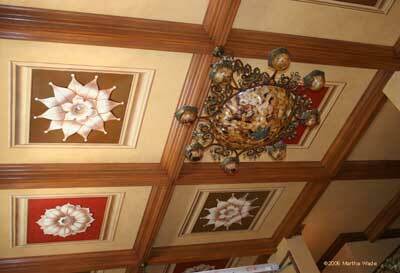 ......and here is more of the ceiling, as well as the client's wonderfully extravagant chandelier.